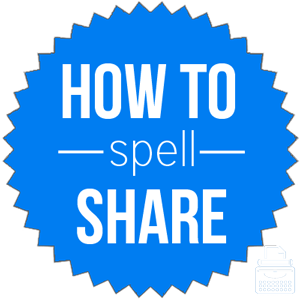 Spelling of Share: Share is spelled s-h-a-r-e. Definition of Share: Share, as a verb, means to divide and distribute in, usually, equal portions; to partake of, experience or enjoy or have in common with others; to grant or give a share in or portion of; to tell (something) to others. As a noun, a share is a piece, portion, or stock in something owned by an individual or group. A share in a business, company, property, etc., is usually paid for or earned through a capital investment. Pronunciation of Share: Share is pronounced shaer. Share rhymes with care, bare, bear, mare, dare, fare, fair, hair, and prepare. What does share mean? Share can function as both a verb and a noun. As a transitive verb, share means: to divide or distribute in portions or shares; to occupy, experience, or enjoy with others; to have in common; to grant or give a share in; to tell one’s thoughts, feelings, experiences to others. She brought enough candy to share with everyone in the class. Eventually, he became trusting and comfortable enough to share his darkest secrets. As an intransitive verb, share means: to have a share (in); to apportion and take shares of something; to talk about one’s thoughts with others. When you feel ready, we would love for you to share. Long ago, we shared in the profits of the same company. Share can also be used as a noun. As a noun, it refers to a stock(s) in a business or company, a portion belonging to or contributed by one person, or a part of a property or corporation. After a long discussion with his wife, he decided to purchase shares in the up and coming tech company. Make sure everyone in your group does their fair share of the work. Go shares: to have equal concern or to partake equally, as in a business venture. Share of the pie: a portion or piece of an amount of money. Fair share: a reasonable or fair amount of something. Share the wealth: to spread or share one’s riches, goods, etc., with others instead of keeping it for oneself. The Lion’s Share: a larger portion than others’ portions; the largest part of a whole. Share was first used as a verb in 1590, according to Merriam-Webster’s. Share comes from Middle English schare, from the Old English word scear, scearu, division, which is akin to the Old High German scaro, meaning plowshare. Share can function as both a noun and a verb, but it is used as a verb more often. As a verb, generally, the word involves giving or taking a piece or part of something. As a noun, it usually refers to one’s piece or part in something.